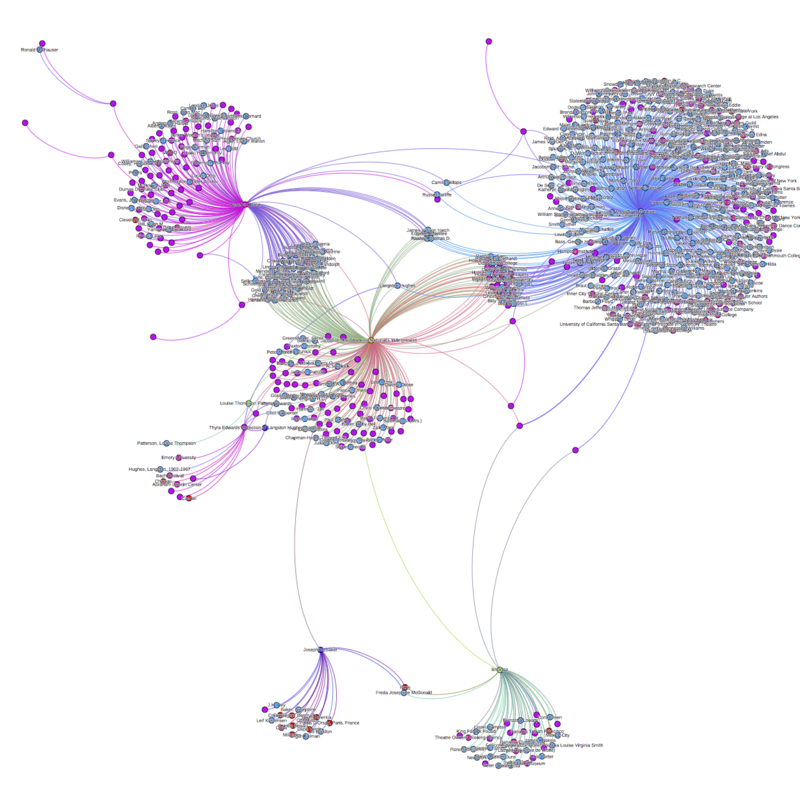 This graph (made with Gephi) visualizes connections among a selection of 20th century African American collections in MARBL. Interpretation tbd. I presented on networks of African American antifascist poetry from the 1930s and 1940s at the Global Lives of Poems seminar at ACLA at the end of March. I wanted to start to map networks of circulation and collection, both the interpersonal and publishing circuits that poems travelled around the moment of writing, as well as their afterlife, in translation, republication, and acquisition by institutional archives. Preparing for the presentation at ACLA helped me to think through the questions I want my postdoc project to answer. In the 1930s, as poets rallied around antifascist and antiracist causes, they used poetry as a medium for political work. They wrote poems on the racist injustice in the Scottsboro boys’ trials; they wrote about Italy’s attack on Ethiopia; the Spanish Civil War; Nazi violence in Europe; Czechoslovakia; China. Poems from the age of fascism, which had a strong sense of their message-sending properties, often circulated widely, to publications in various countries, and to the author’s friends and contacts at home and abroad. But because of the urgency of their cause they were often published quickly and ephemerally—for instance, in newspapers or pamphlets—and would not always find the relative permanence of publication in a book. In 1938, Langston Hughes argued that the shortest story or poem would be the better for the author’s underlying understanding of the world events that surround the scene they depict. “The shortest poem or story—let us say about a child playing quietly alone in a courtyard—and such a poem or story will be a better one if the author understands the relationship of his child to the Tokio war-machine moving against China.” . I’d like to extrapolate the trajectory of this argument to make a point about literary scholarship, to say that our reading of poems with global lives will be the better for an understanding of the routes by which they reach us. That is, not only the friendships and writerly relationships that got things published, or if not published, preserved in the papers of the recipient—but also the historical and institutional currents that allowed for these papers, manuscripts and letters to reach institutional archives, where scholars might then access them. People also read and saved publications—books, clippings in scrapbooks, saved pamphlets—that tell us something about the circulation and reception of the materials. Thyra Edwards, for instance, keeps a clipping of Hughes’s poem “Mother to Son,” published in The People’s Voice in 1942, framed by a photograph of a mother reading a letter beside a photograph of a soldier. “Mother to Son” was originally published in Hughes’s 1926 Weary Blues but had a long afterlife, reprinted in newspapers throughout the 1930s and early 1940s, as well as set to music and performed around the United States. A network graph created with Gephi and some hand-entered data from my dissertation research. I am interested in who was sending and receiving work, who was reading what, who was collecting work. I am inferring these circulations backwards, from the letters and manuscripts, pamphlets and newspapers that reached institutional archives and libraries. Because I am relying on archival papers, I am also interested in tracking who was involved in getting the collection to the institutional archive–whether the person who originally created or received the materials, or a scholar researching and shepherding primary materials related to their research subject, or an independent collector, or a curator. The routes of papers to the archives, in all of these cases, are facilitated by interpersonal networks, the flavor of which may not be easily delineated in shorthand, or, say, the color of an edge line on a network graph. Building on the Belfast Group methodology, I am using finding aids of collections related to twentieth century African American writers to explore the circulation of artistic work. After work by Rebecca (and testing by Elizabeth and me), I am able to mark up the EAD of finding aids not just to indicate names of people, places, and organizations with authority file numbers from VIAF and Geonames.org (which they previously developed for the Belfast Group), but also titles of works with genre types and OCLC, ISSN, and ISBN authority file numbers, to generate accurate RDFa and export data for use in Gephi. 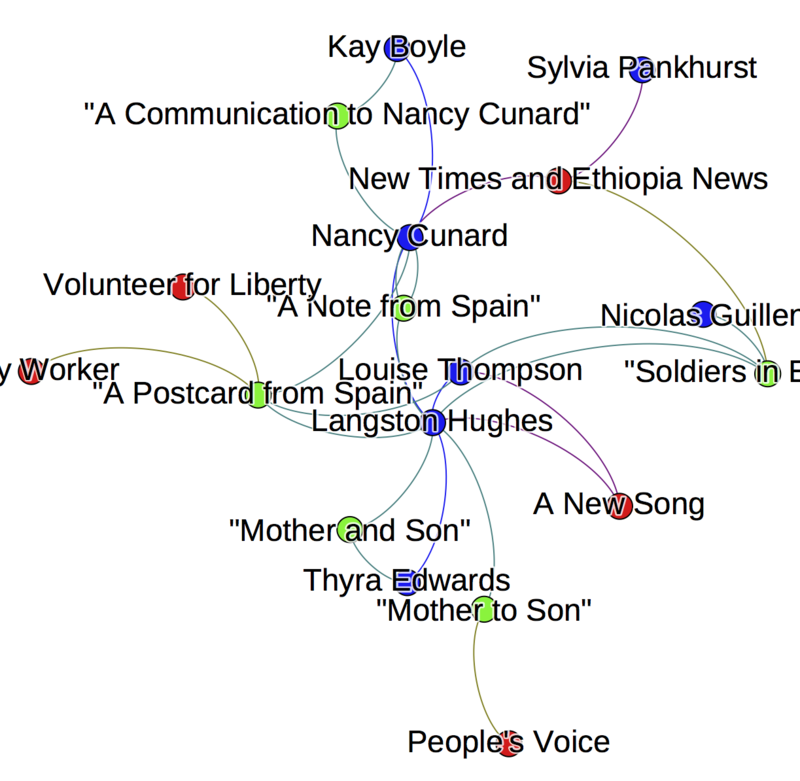 I am now able to graph relations between collections and titles of poems, songs, plays, books, and visual works. Throughout this process, I’ve been urged to figure out what questions I want to answer. Now that I have some data to play with in Gephi, it is getting easier to think about what problems I may be able to pose. My dissertation got me interested in people who weren’t necessarily writers but played major roles in the circulation and publication of writing. With this project, I hope that I’ll be able to look for such figures while using network graphs to visually document and analyze the materials and interpersonal relationships evidenced in the finding aids.